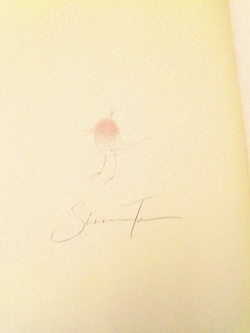 An excellent unread copy - signed and doodled with a bird (created with Tan's "trademark" red ink fingerprint). Very rare UK hb signed at a recent event in Waterstone's Picadilly. Synopsis : What do the bird king, the thing in the bathroom and the paraffin-oil koala have in common? 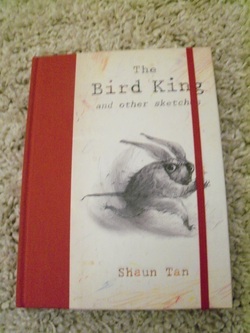 They all inhabit the unique world of renowned artist, author and illustrator Shaun Tan. Collected from his working sketchbooks, with commentary by the artist, these ideas, studies and doodles offer a special insight into the imagination of this internationally acclaimed storyteller. 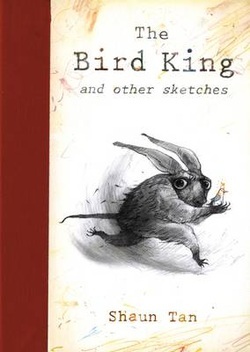 The Bird King is a collection of sketches, random jottings, preliminary designs for book, film and theatre projects, sketchbook pages and drawings from life. Each of these represent some aspect of a working process, whereby stories generally evolve from visual research and free-wheeling doodles. They are also 'unfinished' pieces created in a single sitting, not originally intended for publication, and for that reason perhaps more revealing of a personal style (and particular obsessions) than other more polished artwork.